This post originally appeared in our monthly Newsletter back in April, 2015. Happy Birthday to us! Our little cafe hit double digits this month. Ten years! To be exact, we started pouring coffee and serving up pie June 13, 2005. But we didn’t come here just to talk about us. Well mostly about us, but by us we mean everyone up and down our stretch of southeast Stark. The Bipartisan story starts decades before the doors opened. Our intrepid Peter Emerson had been building the cafe in his head for 20-years before he opened the Oregonian classifieds (remember classifieds?) one day to finally to hunt for a space. Actually, what he found looked nothing like the neighborhood we love today. It was Flying Pie, Tub and Tan, Ya Hala and not much else. Nary a pedestrian in sight. Purples and pinks, piled with boxes and boxes of junk. The hardwoods and walls buried under pressed board and the upper windows covered by brick on the outside and hidden above low drop ceiling inside. What we mean is, it didn’t look so promising. Despite his banker’s lack-of-faith, nay-say warning that Montavilla had been “an up and coming neighborhood since the 70s,” and wasn’t likely to ever come up, he went for it. Layer by layer Peter and Hobie peeled back pressed board to expose one happy surprise after another. The hard wood floors. The beautiful exposed beams. The wainscoting on the walls. Business by business the neighbors filled in around us. The Academy. Vintage. The Country Cat. 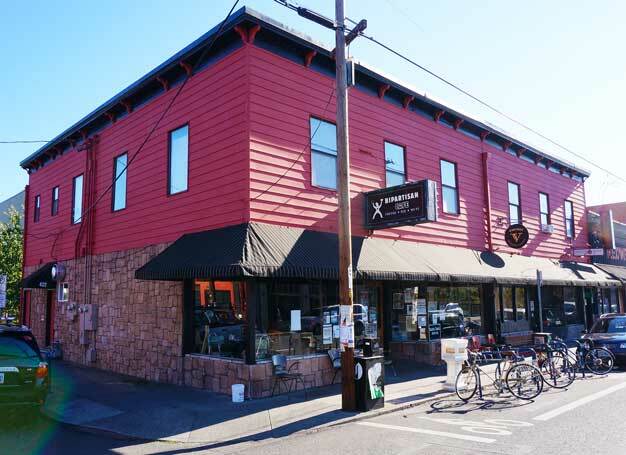 Day by day, month by month neighbors who’d spent years driving out of Montavilla for what they needed began walking down the street for a cup of coffee or a bite to eat. Hanging out at home. Making a community out of Montavilla. Ten years ago we opened with Pete at the register, Hobie rolling out her world-class, soon to be nationally renowned pies and two baristas pouring drinks. Fast forward. Dozens and dozens of students and artists and healers have been part of our family while they build their passions up strong enough to carry them. We have a farmers market, a theater, fantastic restaurants and more coming. A brewery of our own on the cusp of opening. We could not imagine the Bipartisan Cafe in any other neighborhood. Thanks, Montavilla. Thanks, Montavillians. No better people anywhere. We could not possibly love you more. We cannot wait to celebrate our birthday properly, the only fitting way, with all of you, at the Montavilla Street Fair in August. Keep your eyes open for details. Much love and infinite thanks from all of us at Bipartisan Cafe.